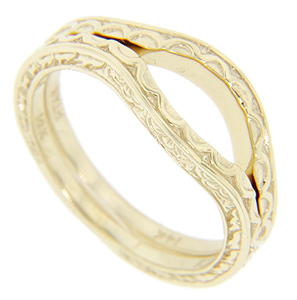 Scalloped shapes decorate the tops of these 14K yellow gold curved wedding bands. 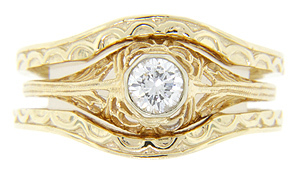 Detailed engraving decorates the rings' sides. The bands measure 3.5mm in width including the curve and are photographed here with R1673 (sold separately). Size: 6 3/4. 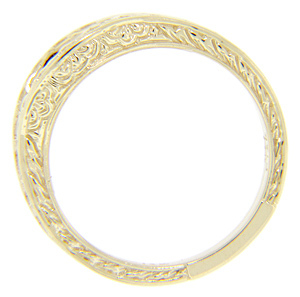 We can resize and reorder in yellow gold and platinum. Prices depend or precious metal market value. The bands are frequently purchased as a set for $650.00 but they are also available individually.